There is a common theme that runs through Link’s Awakening and Ocarina of Time. It is expressed more fully in Majora’s Mask, and summarized at the end of The Wind Waker. These four stories express what it means to live bound to the flow of time. They are stories about the beauty of mortality, the journey from childhood to adulthood and from life to death. They are about growing up and leaving behind the immortal playground of childhood, letting go of the familiar to venture out into the world that lies beyond. …Don’t ever forget me…If you do, I’ll never forgive you! The story of Link’s Awakening is effectively summarized by the metaphor of the Wind Fish’s egg. Life on Koholint is like that of a creature whose life begins inside an egg. The egg incubates the newborn, keeping it safe and comfortable. But the egg is not supposed to last forever. Eventually, the newborn must break the eggshell to enter the world beyond it. Once the shell is broken, the small world inside the egg vanishes forever. The opening chapter of Ocarina of Time plays out much like the story of Link’s Awakening, with Kokiri Forest taking the place of Koholint Island, Saria taking the place of Marin, and the Deku Tree taking the place of the Wind Fish. Like Koholint, the forest is a world where “when” does not seem to exist. The children of the forest always remain as children. The Deku Tree warns the Kokiri that they will die if they cross the barrier separating the forest from the outside world. While Link’s Awakening ended with Link’s decision to leave a timeless world, that decision is simply the beginning of the Hero of Time’s story. Ocarina of Time and Majora’s Mask are both about what it means to live in a world where “when” does exist. They explore how the flow of time shapes Link’s life, transforming both the world he lives in and the person he is at heart. The first part of the story, Ocarina of Time, focuses on the contrast between the world of the child and the world of the adult. In the beginning, Link is simply a child. Kokiri Forest is a child’s playground contained within a protective barrier. As the player, you feel this sense of childhood wonder. Mystical lights dance in the air. Hidden treasures wait to be found. Other children are there to play with; some are friends, some are bullies. At this point in the story, Link is young and inexperienced. When the Deku Tree dies, Navi tries to shield Link from the weight of the tragedy, quickly reminding him that they’re off to see Hyrule Castle. When Saria meets with Link to say good-bye, Link exits awkwardly. Throughout the first part of Ocarina of Time, Link sees the world of Hyrule through the eyes of a child. It is a wonderful, comforting place. There is mystery, there is friendship, and there is danger. There is so much to explore, and there is still a home to return to. But a transition occurs when Link passes through the Door of Time. The childhood world is torn away before Link has a chance to grow up, and he now sees the world of the adult… but still through the eyes of a child. It is a world of fear, loss, romance, and crushing responsibility. Link is not yet too adept at handling it all. During his relationship with Ruto, Link behaves irresponsibly. He has no clue how Ruto feels, staying focused on his own goals. He vanishes from her life for seven years, and when he returns he is oblivious as to how this has affected her. Players see Ruto as some weird psycho girl, because that is how Link perceives her; he has no insight into her feelings. He is still a child. The adult world is overwhelmed by a sense of loss and hardship. Places that once were full of life are now empty and abandoned. Link’s brief reunions with the Sages are tinged with sadness, for they each have separate paths to tread. These childhood friends are no longer a part of the world Link inhabits, though there is still the comfort offered through Saria’s Song. The return to Kokiri Forest as an adult echoes the scene from Link’s Awakening when the ghost returned to haunt his old home. The people Link spent his childhood with don’t recognize him anymore; some fear that he has died. The stump where Saria once sat and played her ocarina with Link has been abandoned. The sense of nostalgia is painful. The world Link used to know has been taken away from him, stolen by time. Ultimately, Link is able to come to terms with the adult world. He triumphantly overthrows Ganondorf and restores peace and justice to Hyrule. Princess Zelda, however, witnesses the pain Link feels when she meets with him as Sheik. She offers him the chance to return home, the place where he is supposed to be, the way he is supposed to be. By doing one good deed, a child becomes an adult. 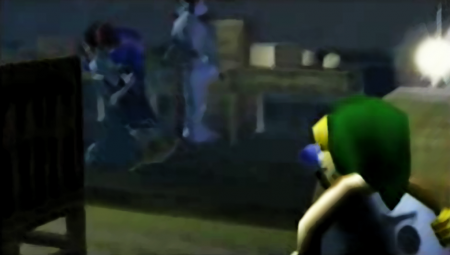 In Ocarina of Time, a child is abruptly thrown into harsh adulthood. Link does not truly belong there, and eventually his childhood world is restored. When the game ends, Link is left in an awkward place. He is not yet an adult, but he has been through too much to feel that he still belongs at his home as a child. He has grown restless. And so Majora’s Mask is about the transformation of Link’s spirit, as the Hero of Time leaves childhood behind to embrace the life of an adult. In Ocarina of Time, the exterior world changed to emphasize the contrast between the perspectives of a child and an adult. The world of Termina does not change as Hyrule did; it remains constant, frozen in a brief cycle of time. This time around, the change occurs inside Link. The world is different based only on how he perceives and approaches it. Once again, the game opens by casting the player into the body of a child, a young Deku Scrub. Link is turned into a child because he has lost his sense of confidence, allowing Skull Kid and his mask to take advantage of Link. This time around, childhood is accompanied by a sense of helplessness, fear, and confusion because something has been lost. The lives of strangers are shrouded in mystery, and the falling moon is an obstacle too powerful to overcome. Adults gush about the Deku Scrub’s cuteness while hiding their true feelings from him. They refuse to let him leave the town, for the field outside is too dangerous for a child. Next comes adolescence. Link’s original form is restored. The world opens up and he is able to venture beyond the walls of Clock Town. Adults demonstrate greater respect for him, and at times communicate with him on a deeper level. Link learns more about the people around him, their feelings and the lives they lead. He learns to handle these relationships more responsibly than the one he had with Ruto, and he is able to meet his obligations to these people instead of acting shocked whenever the subject of commitment arises. As the player progresses through the game, Link continues to grow and transform beyond adolescence. In the form of Darmani, Link takes on the role of a respected hero, a symbol of hope to a community that is barely clinging to life. As Mikau, Link gets a taste of what it means to be in a committed relationship. He observes just how much Mikau means to his girlfriend Lulu, a Ruto look-alike. The transformations place Link in the adult world once more. There is still tragedy, romance, and tremendous responsibility. But the sense of horror that pervaded Ocarina’s adult world has been replaced by a sense of belonging. Unlike Ocarina’s Link, Darmani and Mikau had truly transformed into adults. Link relives the three days again and again, each time gaining a more nuanced understanding of the world of Termina. He learns how to manage time, how to treat people, and how to change the world in ways that once seemed impossible. It gradually becomes apparent that Link is just as important to Clock Town and the surrounding places as Darmani and Mikau had been to their communities. Kafei’s role in the story serves as a sort of counterpart to Link’s. Kafei is an adult who is important to his community. Skull Kid finds him and uses Majora’s Mask to trap Kafei in the form of a vulnerable child. When a thief steals Kafei’s wedding mask, Kafei is too afraid to return home. He becomes intimidated by his obligations, so he simply runs away. He neglects the feelings of the people close to him, and they feel pain and confusion. His adult form is not restored until after he returns home and faces Anju. …Tee-hee! They’re lovers, but they look just like a mother and child. The experience of Majora’s Mask shows that being an adult is not simply about having an older body. The game world is initially a sort of playground where children play hide and seek, but it subtly transforms into a much different place. It becomes a place where there are continuous obligations, where actions have consequences and people have feelings. As Link learns to navigate these complexities, he undergoes his own internal transformation, from a child to an adult. The game’s final transformation mask commemorates the person Link has become. 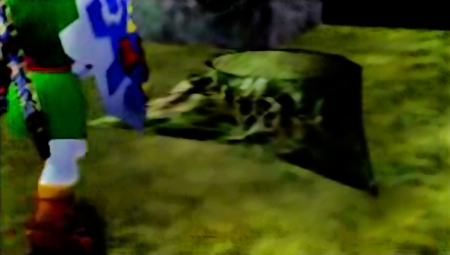 At the beginning of the game, Majora’s Mask recognizes the weakness inside Link, and the mask alters Link’s shape so that his external form reveals Link’s true self: a lost child. Link meets with Majora’s Mask again at the end of the game, but this time the mask offers him the Fierce Deity’s Mask. Link transforms into the Fierce Deity, and once again his outer form reveals his true self: a wise, powerful, and courageous adult. A thing that does not change with time is a memory of younger days. The themes of childhood and adulthood are key elements of the Hero of Time’s story, but the true meaning behind Link’s Awakening, Ocarina of Time, and Majora’s Mask runs even deeper. This meaning involves the relationship between two worlds: one that stays the same forever, and one where “when” exists. The Hero of Time’s story begins in a world of immortal childhood, where the children always remain as children. The hero leaves the unchanging world, even though he is warned that those who leave will one day die. From there, the story revolves around Link’s relationship to the flow of time and how it changes him. In Ocarina, players see the world of adulthood from the perspective of a child. Majora then transforms players so that they see the world from the perspective of an adult, and realize that it is not as bad as it once seemed. And finally, towards the end of the story, players see childhood through the eyes of an adult. This takes place during the finale of Majora, when players enter the world beyond the moon. There is a serene field where children play beneath a magnificent tree. This setting and the events that unfold here contain several layers of allegory that, once understood, reveal the central meaning of the story. Once again, the scene when Koholint’s ghost returns to his house is important here. The field offers Link a glimpse of a beautiful world that he no longer belongs to. The image of the children playing beneath the tree recalls Link’s own childhood, when he lived with the Kokiri in the forest of the Great Deku Tree. Though the children here are strangers, the scene is hauntingly familiar. Like the ghost who took one last look at his earthly home before going to his eternal resting place, Link returns to the world of his childhood one last time before he leaves it behind forever to become the Fierce Deity. The setting itself, the playground of the masked children, has clear ties to Termina. The tree standing at the heart of the playground mirrors the Clock Tower standing at the heart of Termina. The Clock Tower counts down the hours as time passes by. Termina is bound to the flow of time, but the playground beyond the moon is eternal. The Clock Tower symbolizes mortality, while the tree symbolizes immortality. The playground is a paradise untouched by time, an infinitely beautiful and comforting home to the masked children. In this sense, it is just like Koholint Island. However, the tranquility of the scene is disrupted by the roars of distant earthquakes. Like the Ballad of the Wind Fish, these tremors represent the call of the world beyond, a voice asking the dreamers to awaken. Each of the masked children asks to play with Link when he appears in the playground. There are five children, akin to the five members of the Bombers who play with Link. Four of the masked children ask Link to play hide and seek once again. When he finds each of the four children, they are waiting for him in a brightly painted room. Simple, colorful patterns adorn the walls, floor, and ceiling. The room is a child’s playpen. Your friends…What kind of…people are they? I wonder… Do those people…think of you…as a friend? I wonder…What makes you happy… Does it make…others happy, too? I wonder…If you do the right thing… Does it really make…everybody…happy? Your true face…What kind of…face is it? I wonder…The face under the mask… Is that…your true face? The questions reveal that the kids are starting to grow up. They’re starting to wonder about the feelings of the people around them, the nature of right and wrong, and whether they should accept things at face value. These questions are the first steps on the path to adulthood. When Link returns to the field, these children have left. This process represents the end of childhood, but there is also a grander level of symbolism at work. The rooms where the children wait for Link contain four blocks, each with the face of the moon painted on its sides. The blocks are arranged in a compass pattern, representing the four giants and the four worlds of Termina. Termina is represented as a playpen. The more time the player spends in Termina, the smaller the world seems to become. At first, it towers above the young Deku Scrub. But Link’s body is a little taller, and the bodies of Darmani and Mikau are taller still. The player takes on larger forms as the game progresses, even becoming a giant briefly. The larger the player becomes, the smaller the surrounding world appears. When Link stands in the Termina-like playpens, the effect is similar to donning the Giant’s Mask in Twinmold’s arena. The world is so small because in his heart, Link has become a giant. He has outgrown Termina. When the children vanish from the field, it does not simply represent a child entering the adult world. 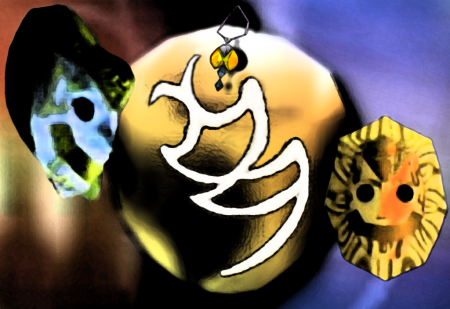 It also symbolizes a soul leaving Termina, letting go of the world of the living to see what lies beyond death. The rising sun will eventually set, a newborn’s life will fade. From sun to moon, moon to sun. Throughout Majora’s Mask, the moon is a symbol of death. It is the source of the ominous earthquakes, the voice telling the children that they have no time left to spend in the playground. The great conflict of Majora is the fact that a world is facing its death. The player is able to observe the different ways people handle the inevitability of the end. Some run away in fear, some hide in the corners of their homes crying. Some abandon all hope and go for one last drink at the bar, while others stand and face the falling moon, cursing it in a fit of madness. Some think of all that has been left unseen and undone, love that has been lost, mistakes that have been made, time that has been wasted. But there are others who find peace. They hold their loved ones close and prepare to greet the morning together. The player has two overarching tasks: to help the people of Termina find acceptance and strength in the face of death, and to grant them more time to spend in the playground that is the living world. There are also others who have been torn away from the playground but continue to haunt it; they are the living dead. Kamaro died before he could teach the world his dance. Darmani died before he could save his people. Mikau dies while his lover still gazes at the sea hopelessly. The land of Ikana has been cursed so that the dead cannot escape it. They roam the earth, plagued with regret. Gibdos wander about underground, longing for worldly pleasures. Sharp and Flat are bound to their old feud. The King and his servants lurk in the darkness of their castle for eternity. 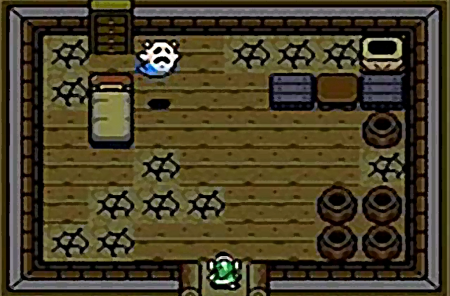 That scene from Link’s Awakening plays out again and again in Majora’s Mask: tormented souls haunt their old homes, yearning for a world where they no longer belong. To them, Link must bring peace. Why do you not stay? In the field with the tree, there is one child who does not leave. The child sits beneath the tree of immortality, holding on to it like Gollum clutching the Ring—the Ring that prolongs life long after all of its beauty has faded away. The four children leave the playground, but the child wearing Majora’s Mask continues to haunt it. This child wants his days in the playground to never end. Skull Kid wanted the giants to be with him forever. Skull Kid and Majora’s Mask cannot stand life in a mortal world. They cannot accept change, they cannot accept that things end. Thus, the true enemy of Majora’s Mask is time itself. The mask’s ultimate objective is to end the flow of time, to end the mortal world where time exists. Hence the symbolic imagery of the falling moon destroying the Clock Tower. Majora’s Mask desires only unchanging immortality, a folly that both Ocarina of Time and Link’s Awakening warn against. Koholint Island is at risk of transforming into a nightmare if the dreamer stays too long. Kokiri Forest is shielded by a curse: mortals who enter the immortal forest turn into monsters. This sort of danger is epitomized by the monster Link battles at the end of Majora’s Mask. When the child sitting under the tree asks to play with Link, the two enter a giant, perverted playpen. It is filled with deadly toys: masks that fire beams of light, and sharp spinning tops that explode. This arena is the opposite of the shrunken playpens of the four other children. Those children outgrew their playpens, but the walls of this playpen tower above the monstrous child who calls it home. That is what Majora truly is: a child who refuses to grow up. Its three manifestations represent childish immaturity. The Child’s Mask hides the child’s true self behind a facade, the Child’s Incarnation lives for the joys of playtime, and the Child’s Wrath lashes out at the world in selfish anger. It holds two monstrous, tentacle-like whips perfect for grabbing hold of something and never letting go. It delights in the agony of those around it and screams in horror and pain whenever it is wounded. This monster is the antithesis of the other four children and the altruistic questions they ask. Bratty, self-centered kids generally need stern parents. Hence, the Fierce Deity. If Link faces the bully in any other body, it is terribly powerful. But the Fierce Deity utterly overpowers Majora’s forms. The adult silences the wailing child as time’s hero brings Majora’s Mask’s playtime to an end. Whenever there is a meeting, a parting is sure to follow. However, that parting need not last forever. Whether a parting be forever or merely for a short time… that is up to you. The tree standing in the playground represents all that is beautiful in life, all that is beloved and invaluable. However, time causes all things to fade. Life’s greatest treasures do not last forever. Those who love the tree must learn to let go of it when time comes to take it away. This is why the Hero of Time’s story begins with the death of the Great Deku Tree. Throughout Ocarina and Majora, trees and tree stumps are used to represent simple beauty and tragic loss. One of the brightest aspects of Link’s childhood is his friendship with Saria. When Link returns to the Sacred Forest Meadow where she taught him Saria’s Song, he pauses for a moment beside the empty tree stump. When Skull Kid became friends with Tatl and Tael, he carved a picture of the three of them in a tree. After their friendship becomes fragmented, Tatl sees the carving and remembers those happier days. Saria’s Song plays during this sequence. 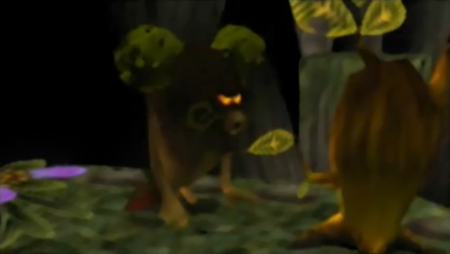 Early in Majora, Link finds a tree that looks like it’s about to cry. The tree is the dead body of the Deku Butler’s son—Skull Kid killed it to create Link’s Deku Scrub form. At the end of the game, the Deku Butler kneels before the tree and mourns his son. 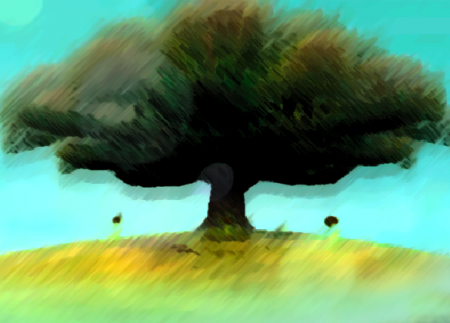 Majora’s Mask represents the temptation to sit beneath that tree forever, to never let go of it. The only way to grow is to overcome that temptation. Majora’s story is framed by Link’s search for Navi. Though players generally have mixed feelings about this guardian fairy, she meant an awful lot to Link. As a kid, Link was bullied for being different, being the one Kokiri with no fairy companion. The carvings at the base of Link’s home show a dinosaur fighting a warrior who has a fairy at his side, showing how Link longed for this companionship. When Navi came to Link, his whole life changed. Saria was happy for him, and he could stand up to Mido. Navi was with Link when he left the forest, when he lost seven years of his life, when he returned home and no one recognized him. She believed in him, supported him, and kept him headed in the right direction. For every meeting, there is a parting. Without Navi, Link feels lost and alone. Link’s feelings towards his beloved guardian and friend are represented by the beauty of the immortal tree in the field beyond the moon. Link has been separated from the tree. 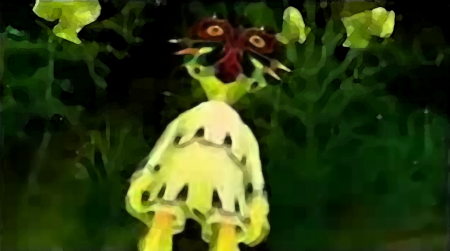 The fear and confusion inherent in Majora’s first three-day cycle represent Link’s resulting mental state. Whether the parting, the period of mourning, lasts forever or merely for a short time… that is up to him. At the heart of Majora’s Mask is the story of Link recovering from the loss of his friend, the story of Link learning to let go of the tree. The game ends with Saria’s Song playing over the image of a tree stump where Link carves his memories of Termina: he let go of one tree and found a new one. For the Deku Butler, for the Goron Elder’s son, and for Lulu, the story is about to begin again. I can see this girl’s dreams. The Wind Waker tells this same story of mortality and immortality, of beauty and loss, of wandering spirits with lingering regrets. In this game, the ancient kingdom of Hyrule represents the immortal world, and the Great Sea is the mortal world. 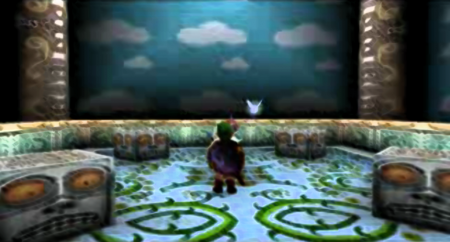 The part of Koholint’s ghost is played by Ganondorf and King Daphnes, who are overwhelmed with nostalgia for their lost home. One of the great highlights of the game is the discovery of Hyrule sleeping on the ocean floor. For most of the game, the player sees only vast seas with small islands scattered across them, but here there are tall mountains and rolling hills. This contrast between ocean and land is akin to the contrast Majora created between the world of the three-day cycle and the field where time stands still. So many pathetic creatures, scattered across a handful of islands, drifting on this sea like fallen leaves on a forgotten pool… What can they possibly hope to achieve? Ganondorf and Daphnes both perceive Hyrule the way the Hero of Time perceives Navi, the way Skull Kid perceives his days with the giants, the way the Deku King perceives his daughter: a lone, beautiful tree surrounded by vast, barren fields. When the tree is lost, all that remains is seeming emptiness. Gods! Hear that which I desire! Expose this land to the rays of the sun once more! Let them burn forth! But the King of Hyrule learns the same lesson that Link learned in Majora’s Mask: the only way to move forward is to let go of the tree. Hope! I desire hope for these children! Give them a future! Wash away this ancient land of Hyrule! Let a ray of hope shine on the future of the world!!! As the King speaks his wish, a choir sings the Serenade of Water from Ocarina of Time. The King’s wish reflects his own growth. Ganondorf would have reversed the flow of time’s river so that he could relive the past, but the King lets the water wash away the ancient world. Ganondorf, like Majora’s Mask, cannot stand the idea of a world that moves forward, so he attempts to destroy the King’s hope for the future by killing Link and Tetra. When Link defeats Ganondorf, the emissary of the past turns to stone. My children… Listen to me. I have lived regretting the past. And I have faced those regrets. If only I could do things over again… Not a day of my life has gone by without my thoughts turning to my kingdom of old. I have lived bound to Hyrule. I want you to live for the future. There may be nothing left for you… But despite that, you must look forward and walk a path of hope, trusting that it will sustain you when darkness comes. Ocarina of Time begins with Link venturing beyond the confines of his familiar playpen, even if it means his death. This act is what the Legend of Zelda series is all about. The magical feeling players sense in these games is this curiosity, this thirst for discovery, this desire for adventure. It is the call of the future. In Majora’s Mask, this call is represented by the terrifying moon. The people of Termina live clinging to something, holding onto regrets, and thus the prospect of embracing the future frightens them. Link’s Awakening and The Wind Waker both use wind to symbolize moving forward. One game has Link awakening the Wind Fish and the other game is titled The Wind Waker. It ends with Tetra and Link setting sail, letting the wind guide them to a new land. Dream and reality, past and present, immortality and mortality: two worlds, one beyond the reach of time, the other governed by it. The relationship between these two worlds is the theme these four games continuously explore, symbolized by Majora’s juxtaposition of the tree and the Clock Tower. There is the timeless world of childhood, where children play under the supervision of a loving guardian, free from obligations. And there is the passing world of adulthood, where lives are lived according to schedules and everything has an end. As beautiful as childhood’s playground is, eventually children yearn for something more, like Marin longing to see what lies beyond the sea. But when they leave childhood it vanishes forever, like Koholint Island. They enter a new territory, the mortal world of adulthood. But as time passes, even this world becomes smaller, seeming like another playground with finite boundaries. And finally they leave behind this world as well. The living world is like the inside of an egg. Once the shell is broken, that world is gone forever. Restless souls wander where they don’t belong. Bring them calm with the Sun’s Song. The first line of this poem uses the sun to symbolize life, and in Majora’s Mask the moon symbolizes death. Therefore, the meaning of the second line is this: From life to death, death to life. Time marches on and carries the living with it. One day, it asks them to let go of childhood. Another day, it asks them to let go of life. Time brings all things to their end—to termina—and then it releases them. This is the order of the mortal world. The Nightmares, Majora’s Mask, and Ganondorf all try to destroy this order because they are clinging to something precious. The Nightmares want Koholint to last forever, Majora’s Mask wants playtime to last forever, and Ganondorf wants Hyrule to last forever. They all live needing their playpens, in a perpetual state of childhood. Trapped in a mortal existence, they thirst for immortality. For something to truly be immortal, it must be free from the reach of time. The only way to escape time is through death, through an ending. Those who try to hold onto something beautiful forever do not let that beautiful thing die, even as time drains its life. They become like Koholint’s ghost: restless souls, forever haunting that which is gone. As Sheik says to Link in the Sacred Forest Meadow, “The flow of time is always cruel. Its speed seems different to each person, but no one can change it. Immortals yearn for mortality, and mortals yearn for immortality. To find peace, the two worlds must exist in harmony. Though they are apart, memory is the link that binds them together. We let go of the tree to explore the world beyond it, but the tree is never lost. Come Link… Let us awaken… together! !